The blog has been a bit scatter-brained over the past month, with no particular order – so why change, right? Today we are featuring several of our ultra-high resolution 100 megapixel fine art panoramas from our recent photo expeditions. Above is one of our favorite panoramas from a foggy evening shoot in Dover Point, NH, just outside of the great local seafood restaurant, Newick’s. That evening proved an absolutely stunning display of glory and we were able to capture several panoramas as day gave way to night. While in Virginia, we visited one of our favorite locations, White Top Mountain (below) and despite never fully seeing the sun as it set, the low cloud layer and never-ending layers of ridges made for some pretty panoramas all the same. Check out all the fun in the galley below! For information on purchasing any of our fine art pieces, including our stunning metallic prints, please contact us at info@deremerstudios.com. As always, please feel free to download any photos you like – and if you enjoy our photos, please share this blog with your friends and help us spread the word! Over the next few weeks, we’ll be highlighting a series of HD 1080P wallpaper from our recent summer travels through Appalachian Virginia, New Hampshire and Vermont. To kick things off, we’ve got a rather splendid day spent photographing fog along the Piscatiqua River in Coastal NH. As day gave way to the soft tones of dusk, the sun broke through the clouds, transitioning into a sunset that literally cast pinks and oranges and purples over the entire sky. 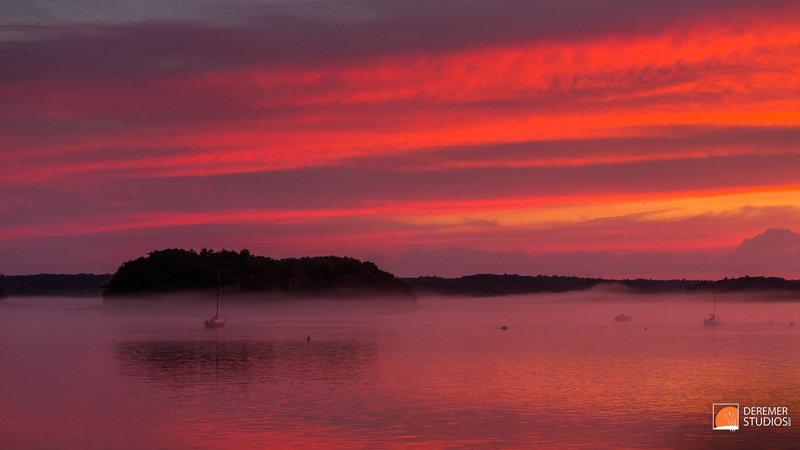 And yet still, even with the fiery colors above, the fog lingered over the swiftly moving river, glowing bright pink as the last memories of light faded into the night. It was truly a gorgeous display of God’s artistry in creation and an absolute joy to be able to photograph. Check out all the fun in the galley below! As always, please feel free to download any photos you like – and if you enjoy our photos, please share this blog with your friends and help us spread the word! Fine Art Series – Travels North Part 10: Mountain Bound! This selection of photos is from the Virginia portion of our trip. 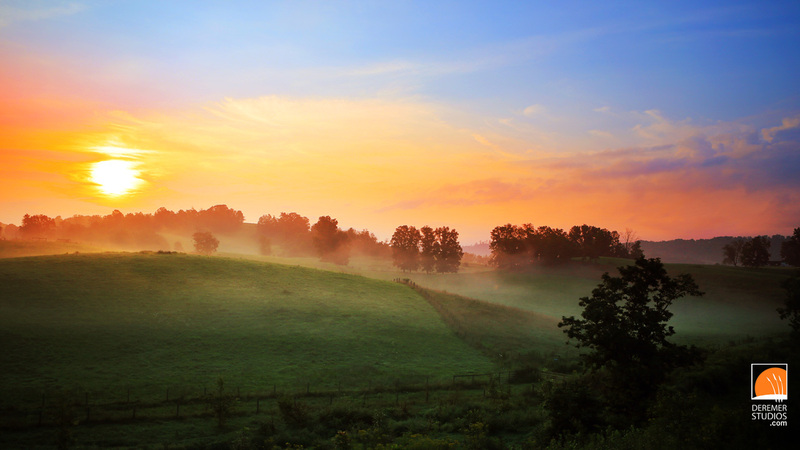 As is usually the custom when we visit western Virginia – I’ll get up for a sunrise shoot, winding along the back country roads in search of the perfect spot to catch the sun as it peeks over the ridge. Above is what I stumbled upon this time – just outside the community of Chilhowie, VA.
Time Lapse video of clouds sweeping along White Top Mountain – 3 second interval. While I absolutely love the rocky coasts of New England and the rustic charm of Central PA, One of my favorite places on this globe has to be White Top Mountain. Every time we’re in Virginia, I take a solo trip up the mountain – driving up the windy gravel road to the beuatiful summit of this rock. White Top boasts the only natural highland meadow in all of the South and usually provides breathtaking vistas of the valley below and row upon row of mountains beyond. A thick but swift moving cloud layer is what I found this year! Here are a few of my favorite shots. Enjoy – and of course, feel free to download as a desktop wallpaper! Welcome to part 3 of our New England adventure. Today’s theme is fog – and there was lots of it during this predawn shoot. 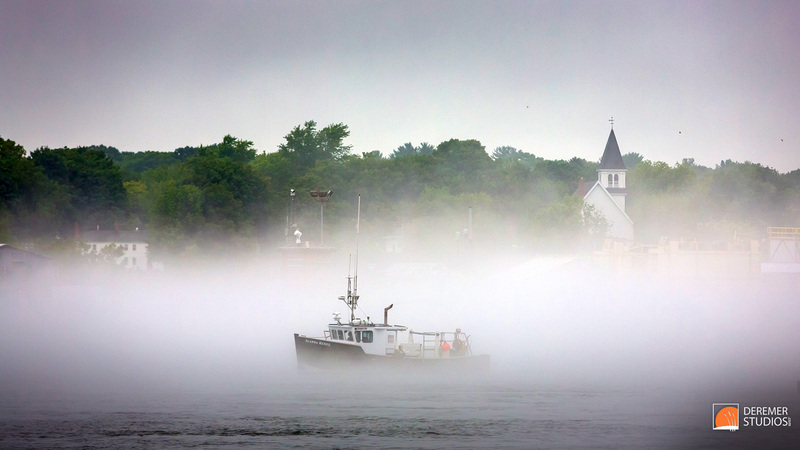 You don’t normally associate fog with winter, but a few times a season, you’ll find the perfect conditions for fog along the banks of the Piscatiqua. 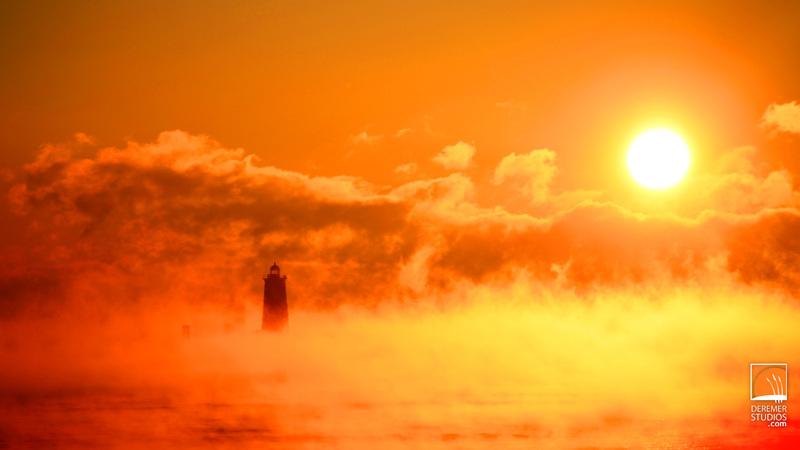 This day was no exception – it was the coldest day of the season and the resulting difference in the temperature of the open water as compared to the air produced this frigid fog over the river. It sure made for some pretty unique photography conditions – and with the 15kt wind and 5F temperatures, it also reminded me of the value of gloves (which I neglected to bring). The photo above was not taken on Halloween, is not from Europe, and does not depict a castle. Shocking, I know. In fact, this is the old prison located on the eastern tip of the Portsmouth Naval Shipyard. 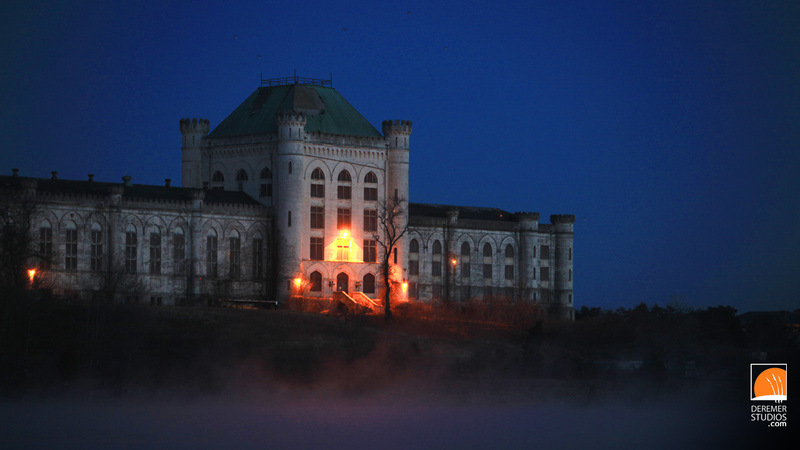 Known in its time as the “Alcatraz of the East”, this turn of the century prison housed a wide variety of military prisoners (including U-boat crews) until it was decommissioned in 1974. You can read more about this fascinating structure here. If you’ve been following our blog recently, you may recognize the lighthouse above. This is Whaleback Light – a granite block lighthouse constructed in 1829. About three years ago, I took a similar sunrise trip to this location under very similar conditions, and took a series of photos as the sun rose over the fog bank. That photo is one of two that National Geographic selected for their prestigious stock photography site. We’ll see how these do! Of course, there’s a nice selection of all my favorite shots from this shoot below. Enjoy! 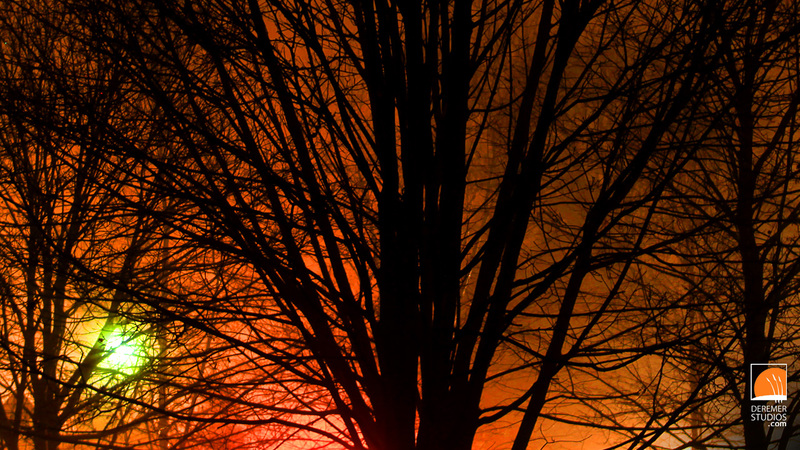 Farewell 2011 – Last Photo of the Year! What did we do for New Years? Take photos of course! Well, that wasn’t the plan, but with an amazing fog bank rolling into the region, I had to step outside and take a few time exposures. So, here is a series of photos from our last shoot of 2011! Wishing you and yours the best for 2012!